There are 4 puzzles that come in a box, with increasing level of difficulty and number of pieces varying from 9,12,15 and 20. The dimension of each solved puzzle is 15cm X 10.5cm. 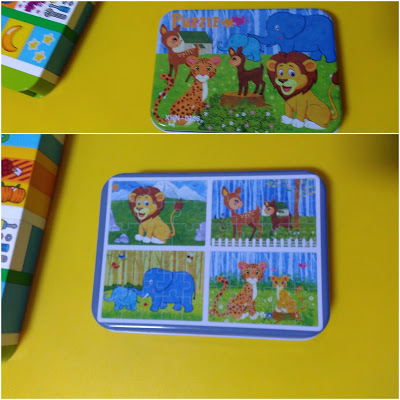 This particular box had an animal(s) theme and all the pictures are shown at the back of the box (Fig. 1). The pieces are sturdy and pasted on ~2-3mm thick cardboard and are easier to handle especially for toddlers. The puzzle pieces are almost uniform in size and big enough not to pose a choking hazard. The picture quality is very good and has a uniform matte finish to the picture, when it is solved. The puzzle pieces have an excellent fit and the texture is perfectly plain and has no bumps, whatsoever. The pictures have good contrast and is easy to distinguish between different puzzle pieces. I feel the design was carefully chosen to give just sufficient clues for young minds to identify the puzzle pieces. What I liked most about the product is the increasing level of complexity it offered in terms of the number of piece, which helped me to introduce one puzzle at a time. So, when the kid became fluent at solving the 9 piece-puzzle, I could easily introduce the 12 piece puzzle, knowing that the kid is motivated and yet finds it challenging enough to attempt it. At S$ 6.90 per box, I really consider it a valuable buy for a single puzzle at under S$ 2.00. Shown below are the snaps of the puzzle box and the videos of a 3 year old attempting the 20 piece puzzle in this set. Edit : We have changed the video to a recent one, where she is solving all the puzzles in this set, which was taken 3 months after she got introduced to the jigsaw puzzles. By this time, she had already graduated to 49 pieces and hence appears to be doing these puzzles decently fast. Lowlights : Nothing in particular; our kid being a restless one, managed to tear the cardboard layers (after innumerable bends and twists) for one piece, and I glued it back and works well.